Pawn your Pink Diamonds! We offer Loans on Pink Diamonds! Diamonds with a pink or red hue are some of the most in-demand gemstones on the planet. They are an extremely exclusive type of diamond, which means it is very easy to get sizeable loans on pink diamonds. If you arrived here through a search to “pawn my pink diamond in London”, you have found the place to go. Turn your asset into collateral by getting a loan at New Bond Street Pawnbrokers. How much can I get if I pawn my pink diamond? There are around 20 million carats of diamonds mined every year, but only around 0.1% are pink. This extreme rarity means that the value of pink diamonds is exceedingly high, so the value of your loan would be high as well. There is always a ton of demand for pink diamonds, and their value continues to increase over time. They come in all sorts of different hues and intensities, so these factors also play a significant part in determining their value. In the last 20 years, the popularity of pink diamonds has increased dramatically, causing their price to go sky high. 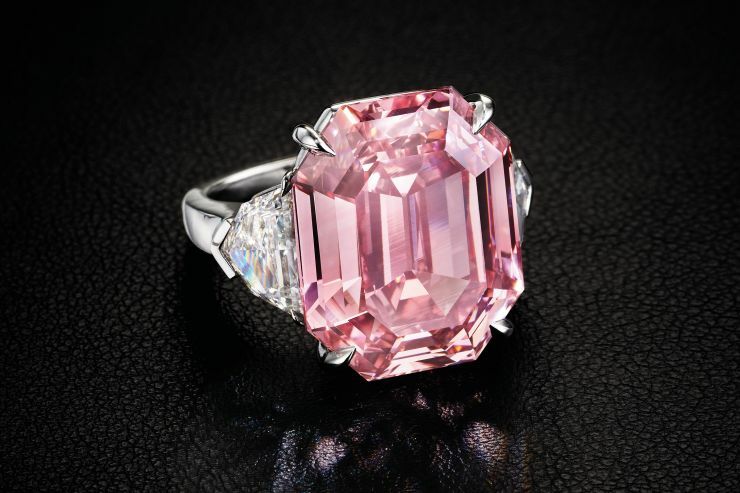 In fact, the Pink Legacy diamond recently sold for an astonishing $50.4 million; one of many spectacular auction sales of pink diamonds over the last few years. And in 2017, the Pink Star sold for $71 million. The science behind diamonds with a pink hue is quite mysterious. With most fancy-coloured diamonds there is quite a simple explanation behind the hue. For example, there are traces of nitrogen in yellow diamonds and boron in blue ones. But pink diamonds don’t contain any impurities, so scientists have struggled to understand what gives them their pink colouring. The speculative explanation is that there is a molecular difference behind it. Getting loans on pink diamonds at our award winning shop in Central London is simple. You can simply bring your stone along, but you might want to call ahead to arrange an appointment for an appraisal to ensure you get the most streamlined experience. You will receive a quote based on your item, produced by our highly qualified and experienced professional associates. Each appraisal is largely based on the 4 C’s of diamond grading: colour, cut, clarity and carat. It is important to have your appraisal undertaken by experienced professionals to get the fairest and most accurate valuation of your pink diamond. This is what you get with New Bond Street Pawnbrokers, along with a high level of service and the utmost discretion from start to finish. Ours is an internationally renowned operation, established over 25 years of hard work forging a reputation among high-end clientele in the London area. As previously mentioned, ownership of a pink diamond means you have a substantial asset that could achieve a sizeable loan with a pawnbroker. It’s a good position to be in if you need a lump sum of cash. Perhaps you need to buy a new car, or you need to pay off some debts that are hanging over your head. Maybe you want to invest in a business venture, or are looking to put down a deposit for a new house. Whatever your reasons for searching “Pawn my pink diamond”, it is a great way to get your hands on some cash without actually selling your property. Whatever your reasons, you can walk away with your cash on the same day you come in for an appraisal; no credit checks necessary. Contact us today to book an appraisal at our site in London, and make your pink diamond make money for you. For more information on services provided by New Bond Street Pawnbrokers please watch our video here and read about the loan process here.